K. Imperial Fine Art is pleased to announce Prodigies of Physical Phenomena, an exhibition by renown experimental filmmaker and artist Lawrence Jordan (b.1934, Denver). Jordan’s first solo exhibit with K. Imperial will showcase new collages and a selection of dioramas made between 1965 and 2004. 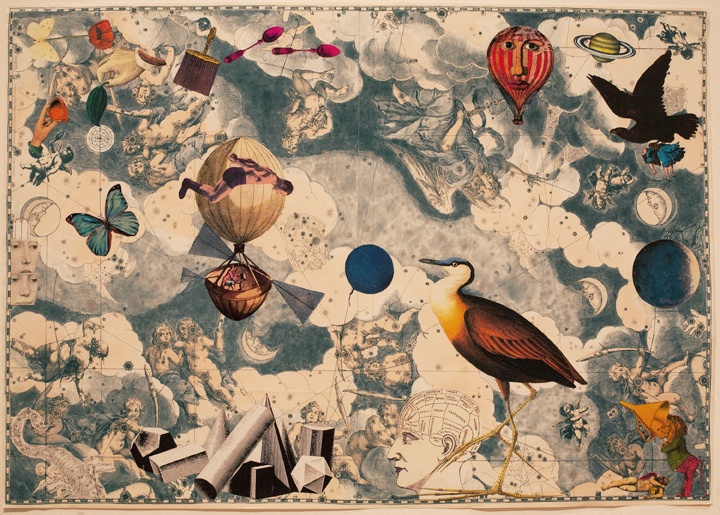 Jordan’s collages and dioramas are playful juxtapositions of two and three dimensions that create strangely seductive narratives and intimate compositions referencing his interest in transformations and the mythic underworld. P. Adams Sitney, in his feature on Jordan for Artforum in 2009, calls Jordan one of the last living artists who still wears the “mask of the mystic, or magus”.1 Sitney explains that the guise of the magician as artist, once prevalent in the Amercian avant-garde- has nearly disappeared from the cultural view- he notes that the last 3 artists who wear this ‘mask’ were Jordan Belson (since deceased), Kenneth Anger and Lawrence Jordan. In looking back at Jordan’s history of nearly 60 years of film and art making, we discover a strong poetic consistency for the enigmatic. The diorama boxes that Jordan learned to make with art-world darling and recluse, Joseph Cornell, in the summer he lived with him in 1965—echo the investigations of his mentor — yet also emphasize their own lyrical explorations, more concerned with the unanswerable questions of the cosmos and the spirit world than the inner secrets of fantasy. Lawrence Jordan clarifies his investigations as alchemic, rather than magical. In his interview in Animation Journal he explains: “You know, Harry [Smith] and Kenneth Anger were both practicing magicians, but I’m not a practicing magician. I’m a practicing alchemist . . . I don’t think the practicing alchemists ever had a codified system. Every one of them were off on their own kick. They had imagery that was like a common language and I use that language . . . Alchemy and constructionism are two ways of saying that you take the things laying around you as detritus, as litter, and you make something that is formal art out of it . . . I’ve been manipulating old imagery with new technology as part of my alchemy.” 2 It is in this physical reuse of materials and imagery—inherent to the practice of collage, that Jordan finds his discourse. Jordan has given extensive oral history sessions for The Smithsonian (with Paul Karlstrom), and at The Getty Research Center, Los Angeles. He is regarded as one of the icons of the Beat Movement, and his history and influence on younger artists is extensive. He is the former founding chair of the film department at the San Francisco Art Institute, where he taught over decades. Jordan’s history and influence in the Bay Area are extensive. His friends, conspirators and collaborators include the painter Jess and his partner Robert Duncan, Wallace Berman, Stan Brakhage, Bruce Conner, Christopher MacClaine, Michael and Joanna McClure and Jay DeFeo; however, his reach and recognition are not limited to a local artworld scene, but are extended to avant-garde cinema globally. Jordan’s cutout collage animations have screened at museums and festivals worldwide. His diorama boxes and collages have exhibited at the National Portrait Gallery –Smithsonian Institution, Whitney Museum of American Art, Santa Monica Museum of Art, Nora Eccles Harrison Museum of Art in Logan, Utah, Ulrich Museum of Art in Wichita, Kansas, Berkeley Art Museum, Gray Art Gallery, in New York, Tokyo Metropolitan Museum of Photography, de Saisett Museum at Santa Clara University, Paule Anglim Gallery, Catherine Clark Gallery and Gallery Extraña in Berkeley. Jordan’s diorama boxes and collages are in the permanent collection of the di Rosa Preserve Museum, Santa Rosa, California as well as in many private collections. Jordan lives and works in Petaluma, California. LAWRENCE JORDAN:Prodigies of Physical Phenomena is curated by Aimee Friberg. Jordan’s work will be included in An Opening of the Field: Jess, Robert Duncan and Their Circle, which opens at the Crocker Museum on June 9th. K. Imperial Fine Art is located at 49 Geary Street on the 4th floor. The artist reception for Jordan is on Saturday, April 6th from 3 – 5pm. For more information on the artist or to inquire about the work, please contact gallery director Aimee Friberg at (415) 277-7230 or aimee (at) kimperialfineart (dot) com. 2. G. T. Collins, “Larry Jordan’s Underworld,” Animation Journal (Fall 1997): 54-69. 03 AprThis entry was published on April 3, 2013 at 3:35 pm. It’s filed underUncategorized and tagged 49 geary, aimee friberg, alchemical art,alchemy, An opening of the field,animation journal, artforum, avant-garde, bay area art history, bay area artist, beat art movement, beat film, bruce conner, christopher macclaine, collage animation,collage art, Crocker Museum, cut out collage, diorama, getty research center, harry smith, jay defeo, jess,joanna mcclure, jordan belson,joseph cornell, k imperial fine art,kenneth anger, larry jordan,lawrence jordan, magician as artist,mask of the mystic, p.adams sitney,paul karlstrom, robert duncan, san francisco art history, san francisco art institute, san francisco artists,stan brakhage, the smithsonian,wallace berman. Bookmark thepermalink. Follow any comments here with the RSS feed for this post.